Wachtfogel grew up on the sands south of the Manhattan Beach Pier where he started playing volleyball by begging for sets between his mother's games. During high school, he played outside hitter at Redondo Union High and led his team to the best season in school history while winning the Daily Breeze Player of the Year Award, Bay League Most Valuable Player Award and garnering All-CIF first-team honors. Following high school, Wachtfogel walked on at the University of the Pacific where he earned an athletic scholarship as a sophomore. After transitioning from libero to outside hitter his sophomore year he left UOP as the all-time leader in career digs and fifth in career kills. As a senior Wachtfogel was award All-Conference Honors, and in just four years graduated with a BS in Economics and a Masters Degree in Business Administration. After a short stint with the indoor U.S. National Team as a libero, Wachtfogel made the decision to pursue beach volleyball full time. He was a 2004 U.S. Amateur Champion. In his rookie season he finished in the top ten twice, once in the AVP Belmar Open and once in the season ending AVP Chicago Open, then accomplished that 12 times in 2006. He ranked seventh on the tour in kills (7.02 per game) and ninth in kill percentage (.587). 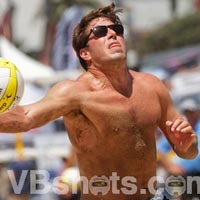 Wachtfogel is well versed in the history of beach volleyball and likes to spend as much time as possible at the beach.